This morning I am buzzing around with my hair on fire because I’m excited about tonights Crotona Midnight Run. I’ve got the usual jitters about making the wrong turn right out of the gate, not being able to follow the route and cocking up royally. But as soon as I pull in to the lot and sign my name on the entry form – I’m hoping that will all go away. 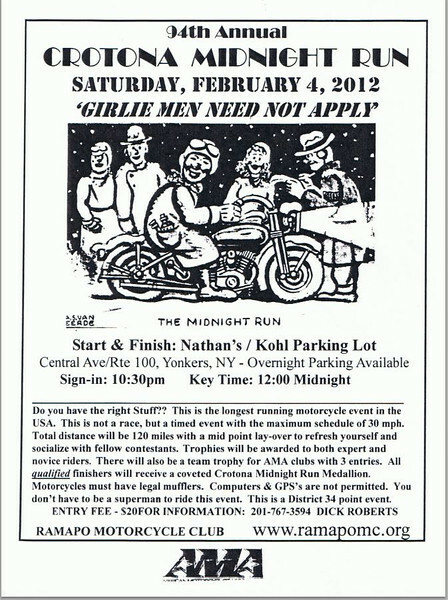 It will be good to see some the other riders and the nice folks at Ramapo Motorcycle Club who stand outside freezing all night checking the riders in. I’ve got my gear laid out, double checked that my warm long socks are clean, I have a spare fleece ready to tuck into my sidebag. I just need to affix my reading light and I’m ready to roll! 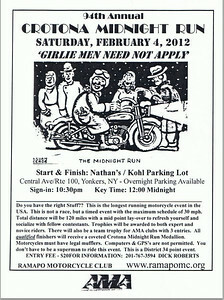 Whoa, It's Almost Crotona Midnight Run Time!